On Sunday, the Guardian Newspaper published the identity of the whistle blower responsible for providing the paper with top-secret documents that revealed the National Security Agency's secret surveillance programs. The paper wrote that it was revealing Edward Snowden's identity at his request. After turning over the documents to The Guardian, Snowden fled to Hong Kong, where he sat for an interview with Greenwald and watched CNN. Snowden lived in Hawaii with his girlfriend, but told the UK paper that he was willing to give all of that up. He said that "he can't in good conscience allow the US government to destroy privacy, Internet freedom, and basic liberties for people around the world with this massive surveillance machine they are secretly building." 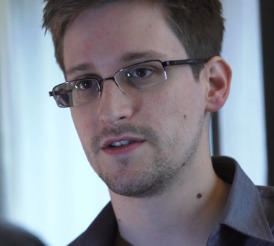 Click The Guardian to watch the interview with Snowden. Labels: Edward Snowden, Edward Snowden Glenn Greenwald, Edward Snowden NSA, Edward Snowden NSA Leak, Glenn Greenwald, Glenn Greenwald Guardian NSA, Guardian NSA Leak, Media News, PRISM.